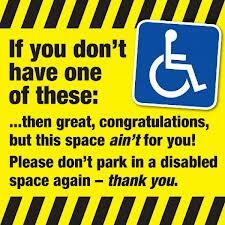 I’m trying to avoid ranting as I like my posts to be light hearted rather than misery inducing but it’s hard when it comes to disabled parking bays! I went to a meeting this morning in Chichester and it usually takes over an hour to get there. This means a tactical toilet stop after 45 minutes because I don’t like turning up to my destination screeching, “where’s the loo?” before I’ve even said “hello” especially when meeting new people as I don’t want this to be the lasting first impression they have of me! When I go to Chichester I usually stop at The Little Chef in Fontwell. It’s “The Devil” I know as I’ve been there lots of times before and am familiar it. There’s a gentle slope from the door to several disabled parking bays and the first space is ideal as the curb also slops gently down so it’s easily negotiated with 2 sticks. Today was a disaster though. The first space was taken by an enormous, black beast and the second space was also occupied. “Eek” I thought, as having to park in the 3rd space will effectively double the distance as I’ll have to go behind the 2 cars. I parked up and started my usual struggle of getting out of the car in an elegant and lady like manner. This was a tactical wee don’t forget so I wasn’t desperate or it would have been “game over” by this point. Anyway, I struggled behind the first car, which I noticed had no blue badge displayed, and carried on behind the second. There was an elderly couple sitting with their doors open having coffee in the sunshine. The man spluttered apologetically at me as I struggled past. They had no badge displayed either but I didn’t like to point this out in case either of them had a genuine disability. At this point 2 young women came bounding out of Burger King giggling and practically skipped past me to their car which was parked in between mine and The Beast. They had the grace to look embarrassed as I carefully hobbled past, trying not to fall over but I hope my struggle made them think. Some able bodied people like to “get away” with parking in disabled bays. I’ve seen them sitting in their cars, looking out for traffic wardens while a companion pops into shops, trying to avoid a ticket. Some of us have a genuine need to park near the door and this is what disabled bays are for. I made it to the loo with the help of several, large men holding doors open for me (I particularly enjoyed that bit!) and made it back to my car without incident. Rant over – apologies for any misery brought on by such as grumpy post! Abuse of disabled parking bays is a pet hate of mine but I think that there is no educating the abusers. They are usually selfish, reckless people who don’t care about the misery they cause.